We are pround to announce the release of the first BETA version of Efficasoft GPS Utilities for iPhone! All feedbacks, error reports, comments and/or suggestions are welcome! This first beta version is released solely for testing purpose. It is designed for iPhone with external GPS receiver. Its ability utilizing iPhone 3G's built-in GPS receiver is still under testing. This beta version is built against firmware 1.1.0 and has been tested on firmware 1.1.4 iPhone with external GPS modules, so should work with higher firmwares. 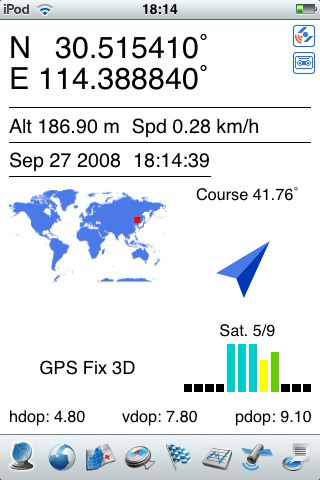 All major GPS Utilities functions are available in this beta version as in the WM and Symbian versions, except the built-in POI & Waypoint Manager, Go To Navigation and a few advanced options. this beta version expires on November 1st , 2008. Efficasoft holds no responsibility whatsoever, for the results of using Efficasoft GPS Utilities for iPhone. iPhone firmware version 1.1.4 (tested) or higher (untested). Install Installer.app program on your iPhone. Start the Installer by tapping the icon on your screen. Type in 'http://www.efficasoft.com/iphone' (without quotes) and tap 'OK'. Wait untill Installer finish refreshing the sources, tap 'Done'. Tap 'Install', and then category 'Efficasoft'. Now you should see 'Efficasoft GPS Utilities for iPhone' on screen, tap it and then tap 'Install' in the top-right corner. Connect the GPS receiver to iPhone. Tap 'Menu (right-most toolbar button), Start GPS'. Put map images in '/var/mobile/Media/My GPS/Maps', so they can be loaded from 'Menu, Maps, Load Map'.